I was searching for a way to use this scrap piece of T-Shirt I had left over from another project and I came up with this cute no sew vest. 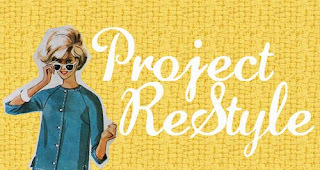 Can you believe, that after today, I will only have 15 more Re-Style projects left to do, for my year of Re-Styling..? It went by so very quick and... 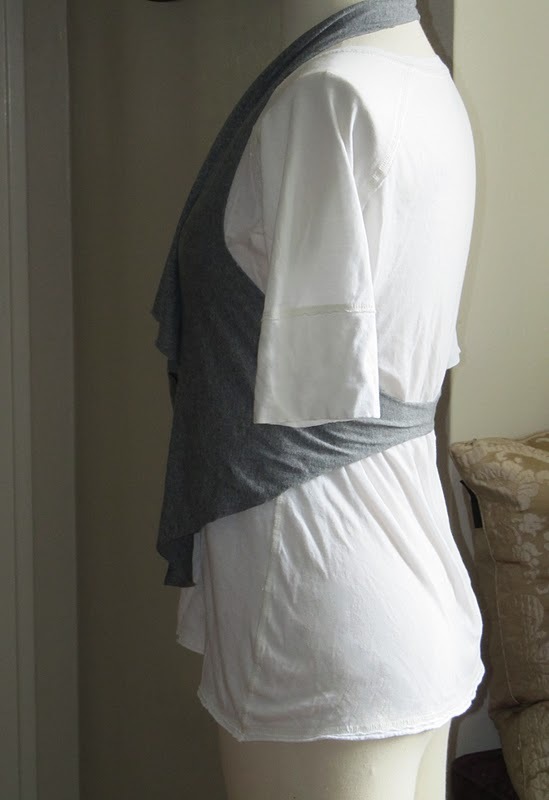 I am thinking about keeping my Re-Style Monday as a permanent fixture on my blog. I guess we will have to see when my 52 Re-Styles are completed. Do any of you have shirts or pieces of shirts you just can't throw away. Well I do, lot's of them.. 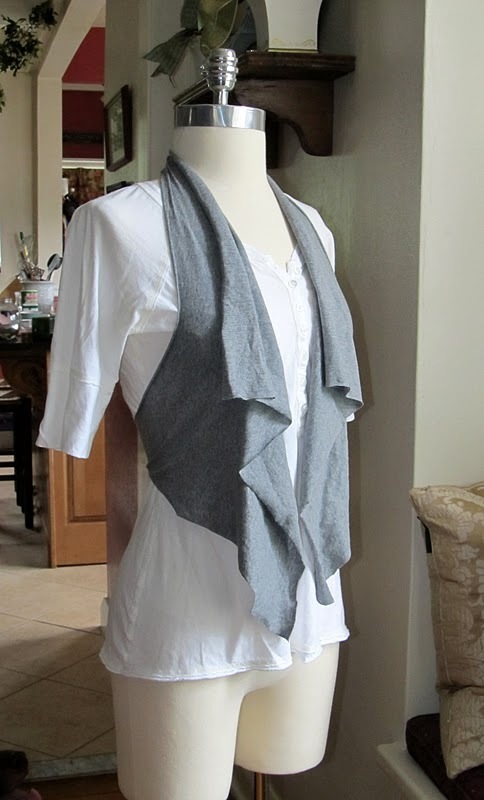 I did a quick search on the internet and found this cute no sew vest on Cut out and Keep. I did do mine slightly different. and it cost me nothing.. Well.... it cost me about 3 dollars for the original shirt. I just love quick, no sew projects, that anyone can do.. 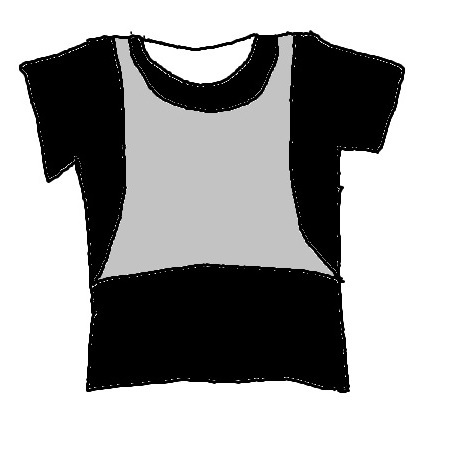 The grey part ( in the picture above) is the scrap of T- shirt I had. 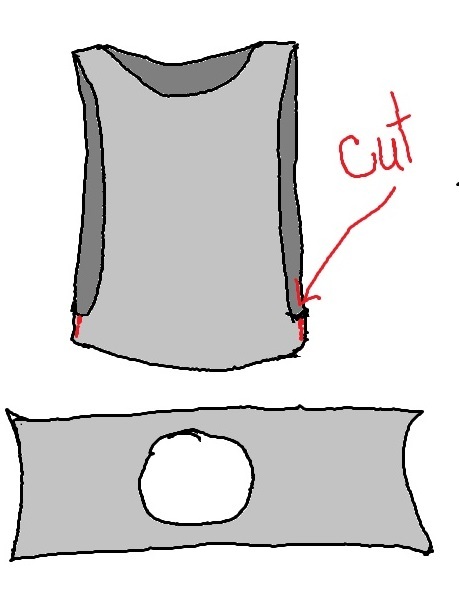 I cut the shirt where it meets at the bottom, this will makes a rectangle( like the picture above) and the rectangle will have a hole in the middle. 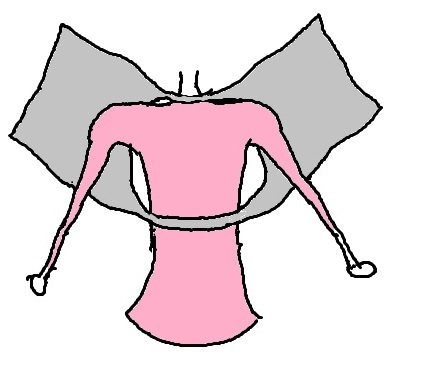 Then you put your arms through the hole. Now you have a super cute vest. See... I told you it was quick. make sure you come back and check it out..
You do know you are brilliant right. You seriously rock and always give me great ideas. I love this!! This is really cool. I'm bookmarking it :). This is really cute...I'm gonna go through my daughter's t's and make her one...she's my vest kid. Thanks. Fabulous idea! and so simple too! Great way to use up a 'scrap' piece! are you flipping kidding me!?!?! this is amazing, anne! AH-MAZING! BOOKMARKING! How have I not found your blog before?!?! 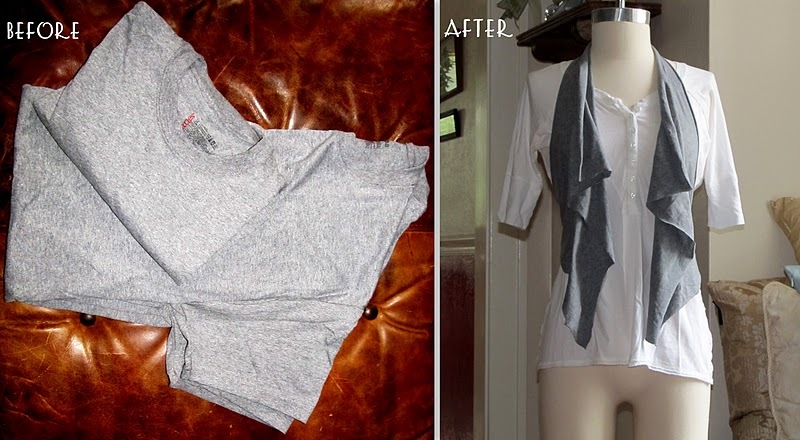 I love this idea and my hubby has so many undershirts that are curling up they would be perfect for this I'm going to make a few! I'm also posting this up on my blogs facebook page. Can't wait to look through your previous re-style posts. Thank goodness for pinterest!! I just found you! LOVE IT!! your'e welcome! 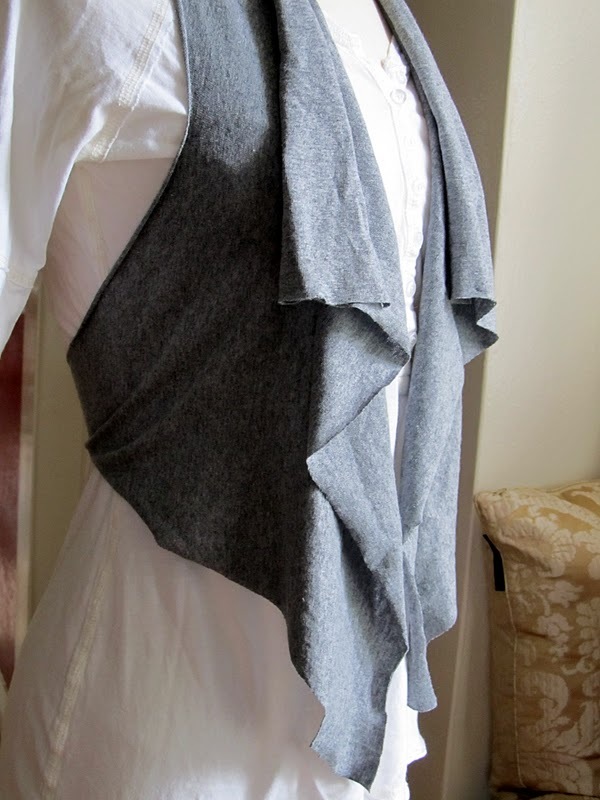 the other no sew vest on here is awesome, too. I was on your blog earlier in the week and saw this. I have searched for a few hours because I couldn't remember your name and I didn't bookmark it. I am so happy I found it. This idea as well as a lot of your other ideas are brilliant. I am so making this one. 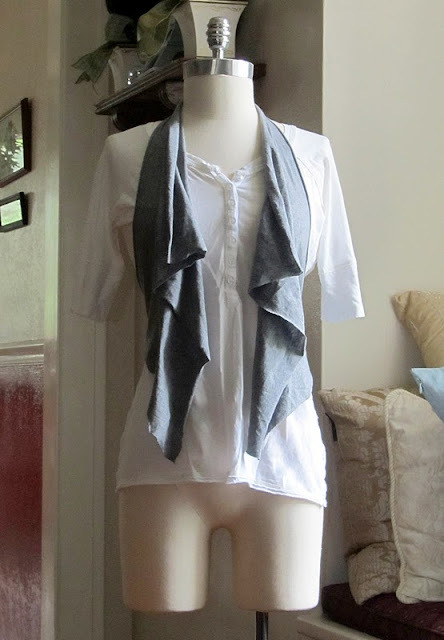 I already made a scarf from an old t-shirt. Thank you so much for your ideas. I love this!!! I'm so going to do this as soon as I get home from work!! Thanks for the great idea! I love how yours turned out but I tried it and mine was horrible! I am big busted and it just looked WRONG! For me, the cut was way too far into the sides where the bust starts and it is not wearable at all. BUMMER! Hey there, Try the Restyle #54 on my site. Just type that into my search bar or better yet I will link it from this page. It comes with a video that might help you. This vest was a much smaller version of that one. I am a little confused on the short vest, not sure how to make the pattern that you used. Kelly, you can go to my Re-Style #54: 5 minute draped vest #2, just type that in the search box at the top. It has a video. This one is just a shorter version of that one. Is this vest a scrap from an XL shirt as well?!! Yes, it is a scrap piece, and shorter. And you are so sweet Stacy, thank you so much!! Hi, This is genius, and so on trend. Who doesn't have xtra tshirts they just can't part with? My question is what was the original project that this scrap came from.? I'm totally going to do these. Thanks for sharing. It was just a tee shirt that I had cut the bottom off. It was done the same way as the longer version. If you can picture a t-shirt cropped cut off just under the sleeves. I just made this. It is awesome. Thank you so much. Wow! I love T-Shirt projects and since I don't know how to sew this would be the perfect project for me. I'm going to be looking through my drawers and closet for T-Shirts and stocking up on new ones so I can do this. Thanks for posting this awesome tutorial! Can't wait to try it! I so have to try this. Don't get me wrong I love sewing but anything you don't have to sew is still nice and I have been wanting a vest like this. I just made this!! It came out AWESOME!!! I used a plain white t shirt that was another project gone wrong and this camouflaged it PERFECTLY. I decorated with black music notes and stars. Thanks again for this great idea!